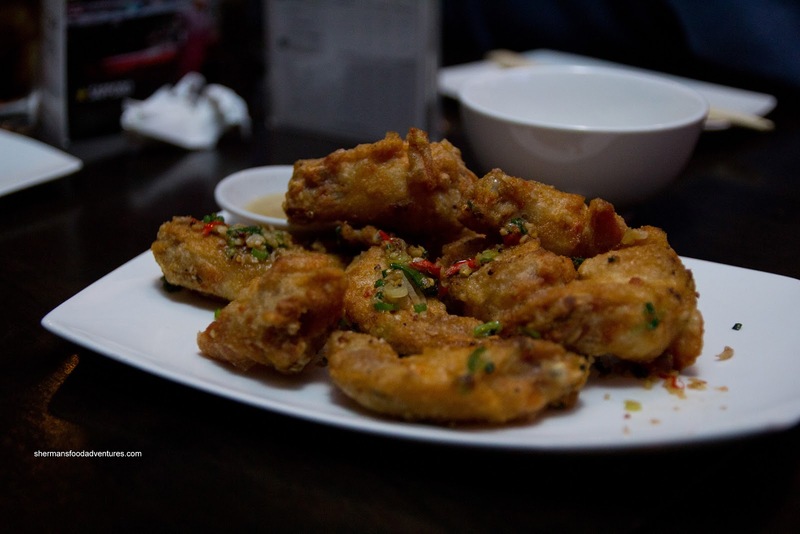 For all the great things to eat in Vancouver, it can be confusing for tourists that a plate of chicken wings can be spoke of so highly. For those who do not know what I'm talking about, I'm referring to the chicken wings at Phnom Penh. Something seemingly so simple, that should be easily replicated, consistently ranks as one of the best eats in town. For me, I love the wings and yes, I will agree with general consensus. But what happens when Phnom Penh is packed (which is a common occurrence)? 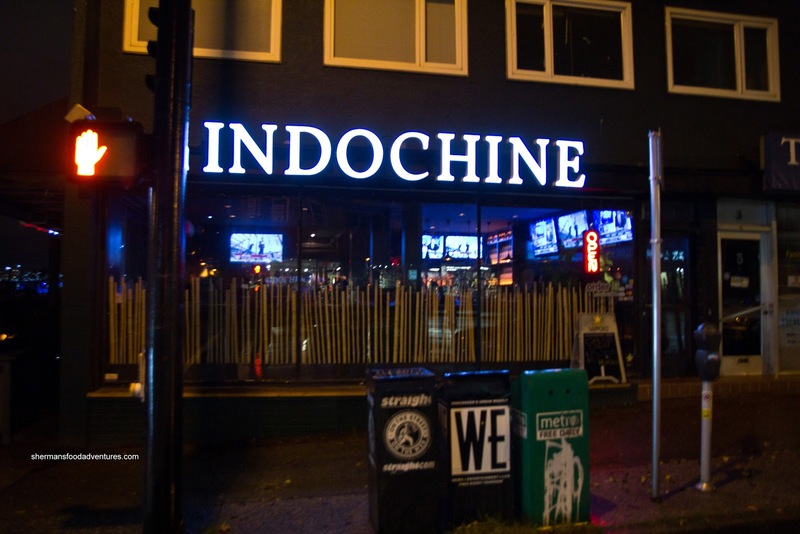 Well, that is what happened to Whipping Girl recently and I suggested she head to Indochine as a back-up plan. Funny thing is - I've never been there! So to right a wrong, I offered it as our late night eats after Friday hockey. Arriving around 10:30pm, the place was hopping with a youthful and boisterous crowd. With its modern decor and attractive staff, this could be considered the anti-thesis of Phnom Penh. To cut to the most important part, we'll go straight to the Garlic Butter Chicken Wings. Sure, there are other places in town that do this dish, but never replicating the ones found at Phnom Pehn. 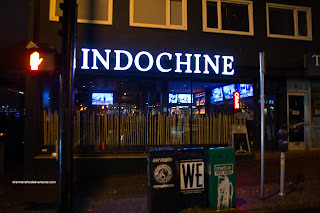 The version at Indochine was pretty good. The exterior was crisp while the meat was juicy and flavourful. It was not as heavy on the MSG as Phnom Penh, yet spicier. Of course, it came with the lemon & white pepper dip, which added a nice acidity. Not as good at Phnom Penh, but good nonetheless. Milhouse, being the health- conscious person that he is, went for the Black Pepper Poutine to start. 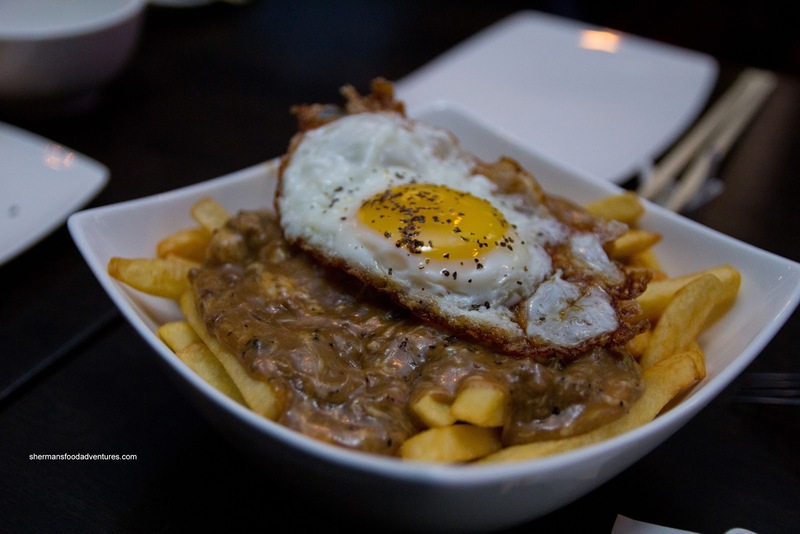 Consisting of ground beef, black pepper gravy, cheese curds and a fried egg atop fries, this was a heavy appetizer. I thought the gravy was pretty good with meatiness and pepperiness. The egg was nice textural addition to the dish, but I would've liked to see some cheese not completely melted. Furthermore, the fries were pretty dense and generic. Something more fresh-cut looking and texturally would've made this even better. We also tried the Black Bean Escargots served with garlic toast. Honestly, I didn't get a whole lot of black bean flavour except for some saltiness. It was more buttery and garlicky like a typical Escargot Bourguignonne. 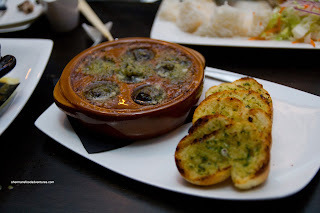 However, this didn't really bother us as it was well-prepared and the crunchy garlic toast went well with the escargots. Mr. Blueberry went for the Lemongrass Chicken with Rice and it was served bone-in, which is typically more flavourful, yet more difficult to eat as well. The meat was moist though while flavourful from the marinade and good char. 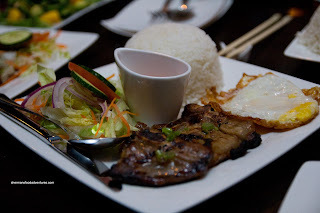 We also got the Lemongrass Pork Chop with Rice, which was more or less the same except with a thin small pork chop. We felt the meat could've been a bit more substantial. 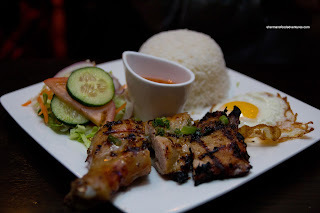 We appreciated the fried egg on both plates, but the one with the pork chop was done poorly. 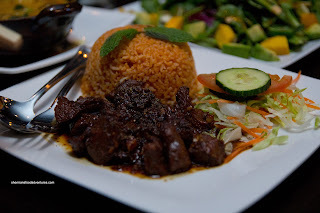 Moving along with another Vietnamese specialty, the Luc Lac Beef was pretty decent as well. The tender morsels of beef were bathed in an impactful garlic butter soy sauce which was on the saltier side. The side of tomato fried rice was atheistically-pleasing as well as pleasant tasting (had a nice chewy texture as well). 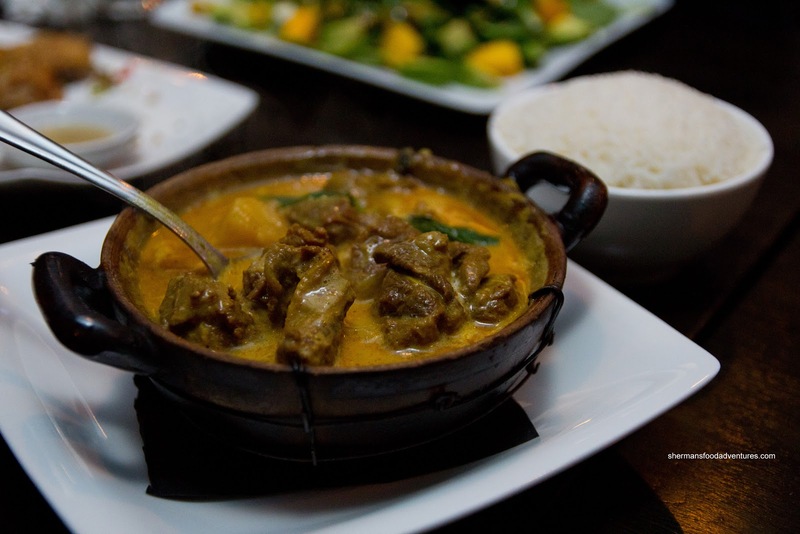 Moving away from Vietnamese cuisine, we had the Coconut Red Curry with beef brisket. The dish was served piping hot consisting of tender chunks of beef brisket and moist potato cubes. However, the actual curry was thin and quite weak. There was very little coconut milk and spice. The flavours were flat and undeveloped. We didn't dislike the dish, but was the weakest of the bunch. Trying to eat healthier and possibly show Milhouse a thing or two, Gadget Girl had the Mango & Avocado Salad. 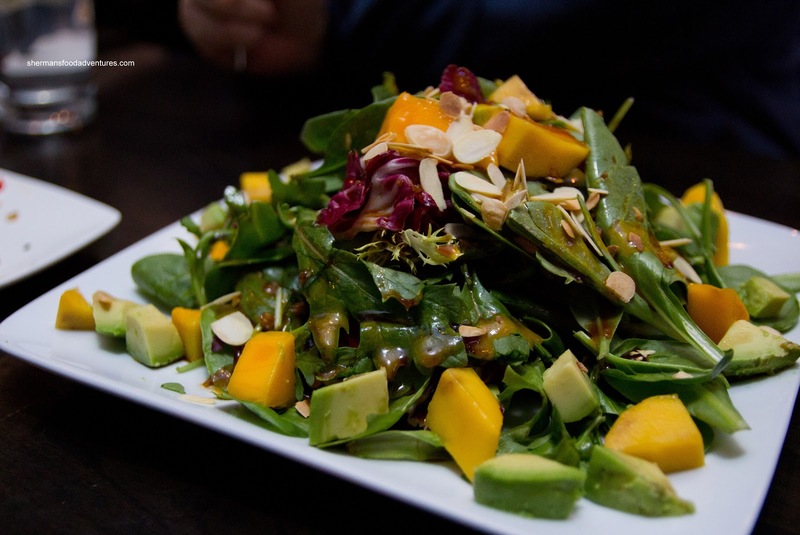 It was more or less a typical salad with a balsamic vinaigrette. It was fresh and pretty large in portion size. In fact, we were pretty pleased with most of the dishes in terms of taste, portion-size and price point. Considering the decor and type of service, we thought the prices were actually quite reasonable. The only thing that might bother some people is the boisterous and rowdy clientele during late night. In that case, go for lunch or an early dinner instead.